Healthy Bile Flow is more easily achieved through preventing gallstones. As explained below, gallstones are formed in the liver as well as gallbladder, so optimizing liver health and thinning the bile are essential. 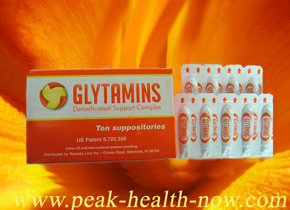 PHOTO ABOVE: Glytamins suppositories contain Amino Acids, herbal extracts such as Bupleurum, AND Magnesium Di-Potassium EDTA. Bile flow is important to our health. 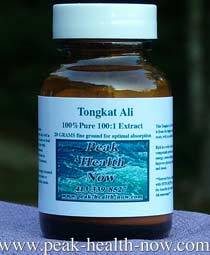 Benefits include better peristalsis, resistance to parasites, elimination of toxins and regulation of acid / alkaline (pH) balance of the small intestine. Bile flow has some very important functions. You must know it emulsifies fats to enable us to digest and assimilate them. Bile also helps to keep the pH of our small intestines at optimal levels. We tend to think mainly of the Gallbladder with regard to bile flow. But where does bile come from..? I was amazed to learn that this greenish fluid is a product recycled from old cells by our bodies. The spleen is an organ not much talked about. One of it's important functions is to gather worn out red blood cells from our bloodstream. As yet another example of the innate intelligence of our bodies, instead of eliminating our used blood cells, we have a spleen to process them into bile salts. Our liver then receives the bile salts and stores them in the gallbladder. In the gallbladder, the water is reabsorbed from the bile salts. 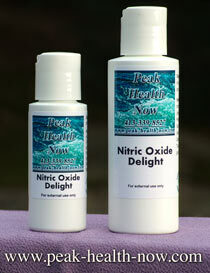 The resulting liquid is very alkaline, concentrated and ready to perform its essential functions. What does Bile Flow do? 1 - Fat Digestion: Emulsifies and breaks down fats so they can be utilized. 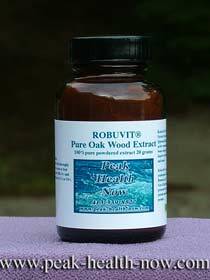 2 - Normalizes pH: Neutralizes hydrochloric acid that enters the small intestine with digested food from the stomach. 3 - Laxative, Peristalsis: Bile flow has a laxative effect, stimulating peristalsis and preventing constipation. 4 - Parasite control: Did you know that healthy bile flow supports resistance to big and little parasites - all the way from worms to viruses? How Does Bile Turn Into Gallstones? Since bile flow is one of the routes that your body uses to get rid of toxins, keeping it moving is vital to keeping you healthy. 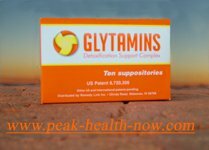 What happens to the bile when the body is so overburdened with toxins that it can't get rid of them in a normal, efficient way? You can visualize an analogous situation to what happens if you don't change the oil in your car's engine often enough; it sludgy, thickens and doesn't' flow freely. The same kind of thing happens when toxins build up beyond our body's ability to eliminate them. Our bile thickens and doesn't flow freely. Gallstones form in both liver and gallbladder from the sludge. Because gallstone formation originates in the liver, even when the gallbladder is surgically removed, a person can still suffer from gallstones! Did you know that not only can poor bile flow create serious liver problems, but it can also damage the pancreas? Gallstones can block bile flow, clogging ducts so much that bile and stones back up into the pancreatic duct, taking another exit route to the small intestine. The problem is that the pancreas has no protection against being burned and damaged by the very alkaline bile. This is because when bile cannot move directly into the small intestine where the acid from the stomach neutralizes its extreme alkalinity (9.5 pH), it is caustic to body tissues. Bile backing up into and damaging pancreas is implicated as a cause of adult onset diabetes! Gallstones come in varying consistencies. I have eliminated some that were small, roundish, light green and crumbly, others that were yellowish, rough-edged and crunchy. I always felt considerably more energetic, happy and clear-minded after getting rid of gallstones. How did I get rid of gallstones? Promoting bile flow, AND enhancing the action of the glutathione s-transferase enzyme system (powerful free-radical-scavenging) were highly effective for me.